Gogarty was born in Dublin and educated at the Royal University, and Trinity College, Dublin, later becoming a successful Dublin surgeon. 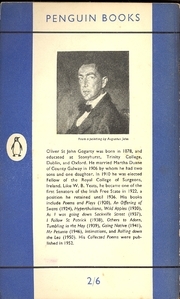 A wit and a poet, Gogarty wrote several books. He took an active interest in Irish politics, being a senator of the Irish Free State 1922–36. As I was Going Down Sackville Street was the cause of a successful libel action against him. In 1939 Gogarty moved permanently to the USA, where he wrote and lectured. He died in New York. Oliver St. John Gogarty is currently considered a "single author." If one or more works are by a distinct, homonymous authors, go ahead and split the author. Oliver St. John Gogarty is composed of 9 names. You can examine and separate out names.